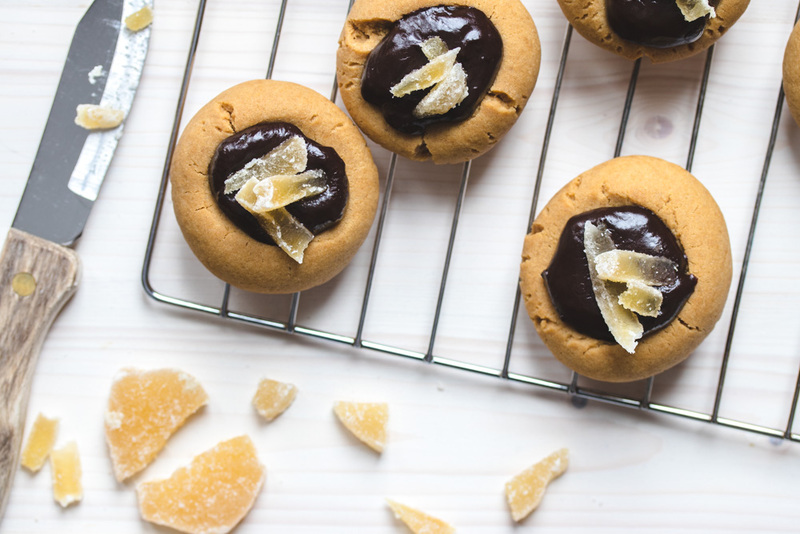 Hey Everyone, We’re getting a jump start on our holiday baking with these Brown Butter Molasses Thumbprint Cookies with Chocolate Ginger Ganache. The holiday season is upon us and pretty soon we’ll be wondering, where has the time gone? And how did it sneak up so fast? And why don’t we have anything done?? But at least we have these gingery, buttery chocolatey delights! Anyhow, I had never made thumbprint cookies before and I found them very relaxing to make. Something about the rolling of the dough into little balls in your palm, and then pressing your thumb into them was soothing. Normally I find baking less enjoyable than cooking because you have to be more precise and I like to have a little room for improvisation. Maybe I need to give it more of a chance! Luckily, the payoff on these cookies was huge. 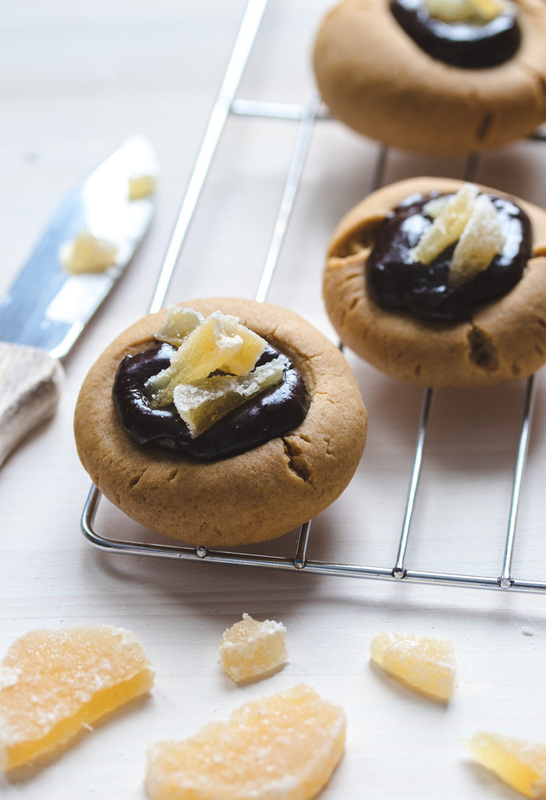 The brown butter and molasses gave a real boost to the shortbread-like base of the cookie. This is complemented by the spicy richness of the chocolate ginger ganache. They are a delicious cookie with flavours that meld together so well! We used fresh ginger in the ganache for a bit of extra zing, but you could substitute dried for a milder flavour if you wanted. 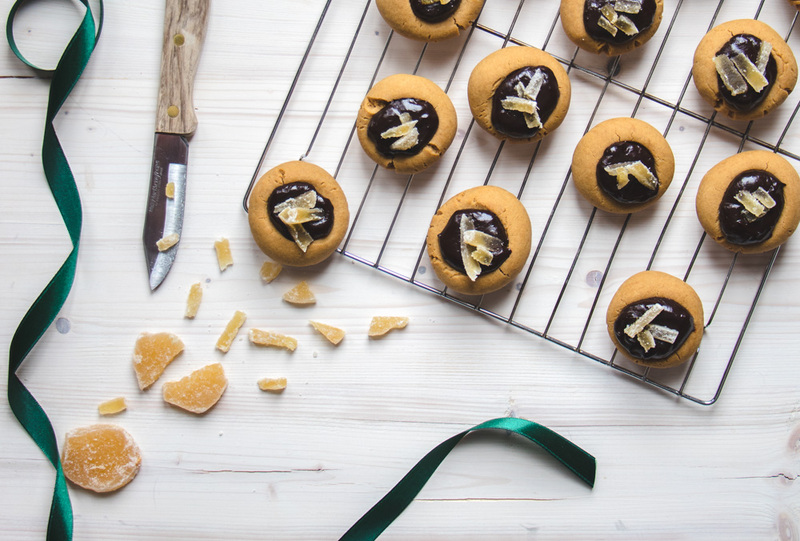 We also recommend taking a less-is-more approach to the candied ginger garnish. That stuff is intense! Another pro tip: don’t microwave your ganache if the chocolate doesn’t melt fully. It won’t improve things at all, in fact you may end up with a lumpy separated mess! We’re speaking from experience here. Just take out the unmelted lump and keep going. 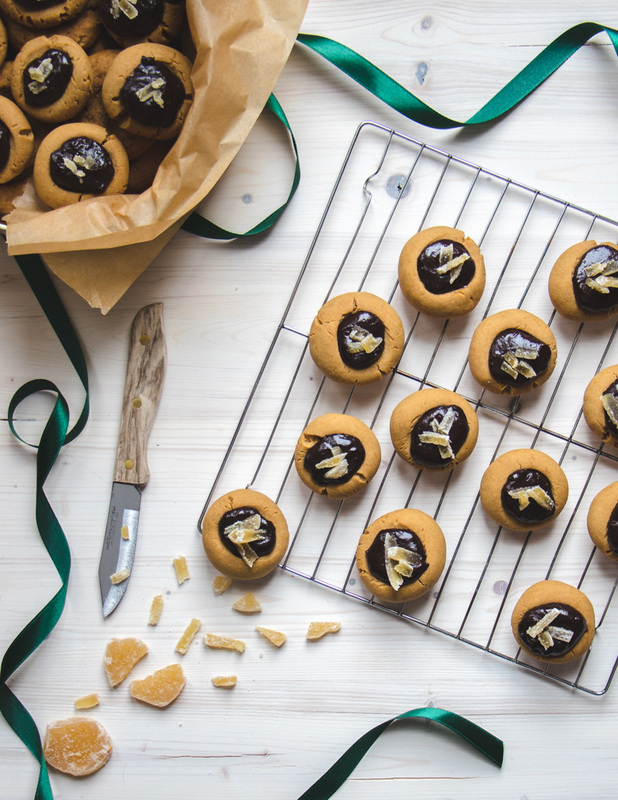 This spin on a classic thumbprint cookie is perfect for the holidays! To freeze, be sure to layer with wax paper in between to prevent the ganache sticking. Be sure to thaw overnight in the fridge so that the ganache doesn't separate. In a saucepan, brown the butter on the stovetop over medium heat, swirling the pan to ensure it browns evenly. Pour into a large bowl (you will be making the cookies in this bowl, so make sure it's big enough). Refrigerate until the butter is slightly cooled and starts to solidify again, around 1 hour. When the butter is close to room temperature again, beat in the brown sugar until light in colour and fluffy. Add in the molasses, vanilla, and egg and beat until fully incorporated. In a separate bowl, whisk together the flour, salt, and baking soda. Sift the flour mixture over the butter mixture and stir together to form a dough that comes together when pressed. Roll the dough into tablespoon-sized balls, make an indent with your thumb or a teaspoon, and place on a parchment-lined baking sheet. Chill the dough for an hour in the freezer, or overnight in the fridge. Bake the cookies at 350F for 8 minutes, rotate the pan and bake for an additional 5-7 minutes or until the bottoms are slightly browned. Remove from oven. If the centres have risen, use a teaspoon to press lightly down again. Let cool 5 minutes on the baking sheet, then remove to a cooling rack. To make the ganache, in a small saucepan, grate the ginger into the whipping cream and heat over medium heat until very hot, but not boiling. Remove from the heat and let steep for 15-20 minutes, stirring occasionally to prevent a skin from forming. Return to the heat once more, then once hot, strain into a bowl over top of the chocolate. make sure all chocolate is submerged, then cover with a plate and let sit for 5 minute or so until chocolate is melted, and then stir to combine. 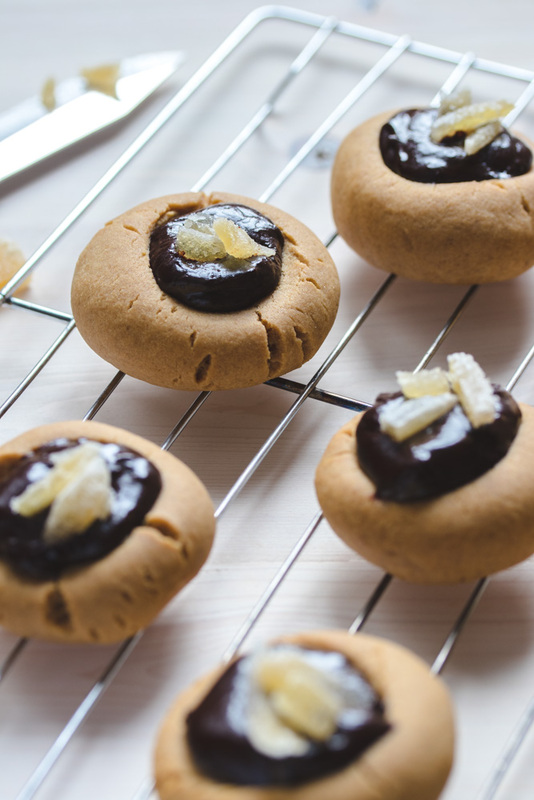 Spoon a teaspoon into the indents of the cooled cookies, and top with chopped candied ginger. Let cool completely before serving.